Little known fact, George Washington was the real-life Benjamin Button; he was born with an adult face on a tiny child body. That statement is as factual as everything else depicted in this painting. 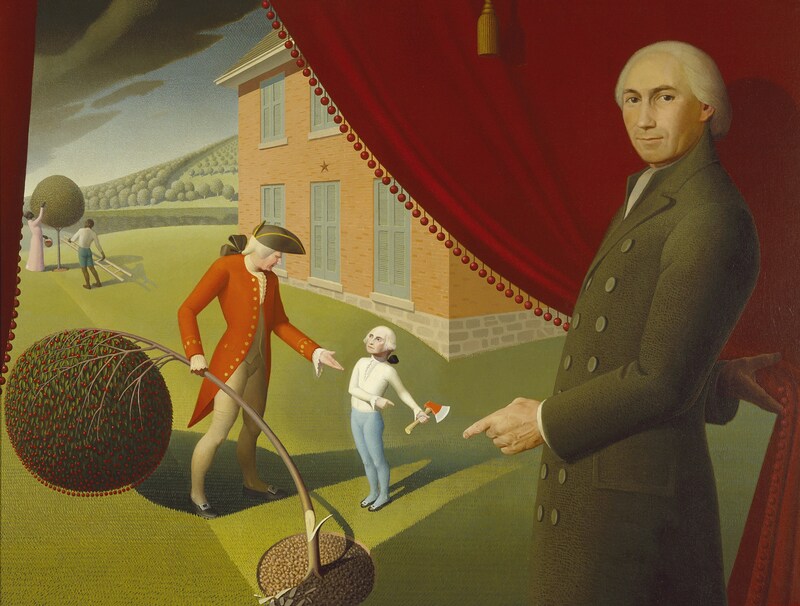 Grant Wood certainly wasn’t going for realism by borrowing Washington’s head from the Lansdowne Portrait. Sorry to break the news, don’t go off to find the Wizard - he can’t give you a brain and Washington didn’t chop down any cherry trees. Before you begin to question everything else you were taught in elementary school, the spotlight shown here isn’t meant to be hating on the story. Much like the embellished portrayal of The Declaration of Independence, Wood was trying to honor it as an important aspect of American culture, but as a fable rather than fact. Take Achilles for instance, no one believes that were was once a demigod dipped into a pool of invulnerability expect for his heel, but the expression “Achille’s heel” is used to the point of cliché regardless. So people can still reference this tale for its moral of the importance of honesty…by ignoring the irony of how the story was created as a lie. The cherry tree story was a hotly debated topic at the time of this painting’s creation. The public was focused on fact-checking and discrediting Weems, whereas Wood appreciated it simply as a story. Hence the literal pulling back of the curtain. The Wizard of Oz wasn’t magical, but he was still a great gift giver and Washington was not an idealized child of honesty but he still crossed the Delaware. Haven, Janet. Grant Wood's Satiric Paintings. Accessed October 17, 2018. http://xroads.virginia. edu/~ma98/haven/wood/satire.html. Dr. Shirley Reece-Hughes, Amon Carter Museum of American Art and Dr. Steven Zucker. "Revisiting the Myth of George Washington and the Cherry Tree." Smarthistory |. Accessed October 17, 2018. https://smarthistory.org/parson-weems-fable-2/.